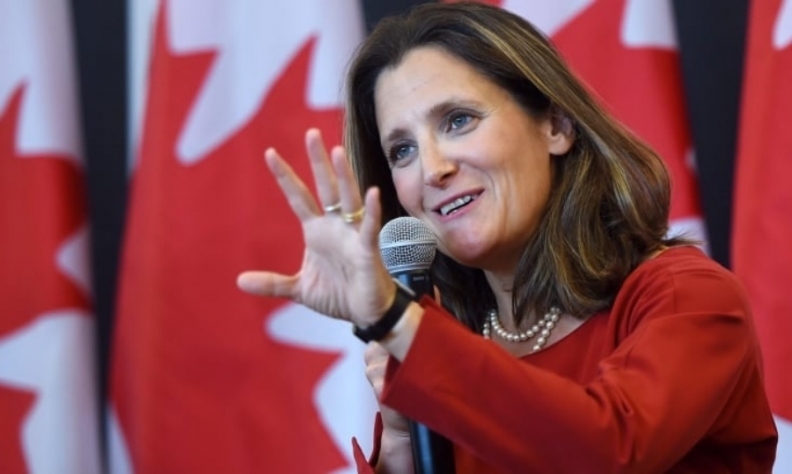 Foreign Affairs Minister Chrystia Freeland, who cut short a week-long diplomatic trip to Europe to travel to Washington, met Tuesday with U.S. Trade Representative Robert Lighthizer. It was her first in-person NAFTA meeting with Lighthizer since the spring. WASHINGTON — Canada and the U.S. agreed Tuesday that one of NAFTA's most significant hurdles — defining the content rules of North American autos — may have been resolved by Monday's side deal between the Trump administration and Mexico. The White House is calling on Canada to endorse what President Donald Trump has described as the North America Free Trade Agreement's replacement, by the end of the week. Trump has already rebranded it the "United States-Mexico trade agreement." Top members of Canada's negotiating team made an abrupt return Tuesday to NAFTA talks in Washington, where they face stiff pressure from Trump to join the deal his administration struck earlier in the week with Mexico. After their one-hour meeting, Freeland told reporters that over the coming days, the negotiating teams would search for new areas of compromise — but she declined to answer direct questions on what could be on the table for Canada. "Some positions have moved since the last time we met face to face and we'll be looking closely at what those changes are and what they mean for Canada," said Freeland, who credited Mexico for making "tough decisions" to compromise on labour as part of its auto rules of origin talks with the United States. The United States and Mexico agreed workers earning at least US$16 an hour should make 40 per cent to 45 per cent of autos. They also agreed that 75 per cent of automobile content would come from within North America, an increase from the current 62.5 per cent. "The fact that that agreement, on those difficult issues for Mexico, was able to be reached definitely clears the way to have significant, substantive and, I hope, productive conversations with the U.S. this week," said Freeland, who called it the autos deal a positive for high-wage countries like Canada and the United States. All sides, she added, agreed to delve deeply into specific issues Wednesday. Earlier in the day, both Larry Kudlow, the director of Trump's National Economic Council, and U.S. Commerce Secretary Wilbur Ross turned up the heat on Canada's negotiators during televised interviews. Serious differences remain on other issues, including the dairy sector, how to settle disputes and a U.S. proposal for a sunset clause. But Ross also told the Fox Business Network program "Mornings With Maria" that the American and Mexican progress on autos would be palatable to Canada. Prime Minister Justin Trudeau signalled agreement. "There's been some very positive progress particularly on autos and we're glad to be engaging as we have been," he told reporters Tuesday in Longueuil, Que. Trump himself has threatened automotive tariffs that would cause considerable damage to both economies if Canada declines to join the U.S.-Mexico deal. He also warned he would terminate the 24-year-old NAFTA, a treaty between Canada, the U.S. and Mexico that has been economically significant for the continent. For the last five weeks, Ottawa has watched from afar as Canada's two continental partners moved forward with one-on-one trade talks of their own. "We have been encouraged by the progress made by our NAFTA partners over the past weeks," Trudeau said. "This was an important step to moving forward on renegotiating and improving NAFTA." The United States and Mexico also agreed on issues such as intellectual property, digital trade, labour, financial services and Mexico's de minimis threshold for duty-free online sales that cross borders. In addition, the new deal would expire after 16 years with reviews every six years, a senior U.S. administration official said Monday during a briefing. Canada had rejected an earlier U.S. proposal that NAFTA 2.0 be renegotiated — or sunsetted, in trade lingo — every five years. Trudeau sidestepped a question about the new version of the sunset clause in the U.S.-Mexico deal. Trump, who has called NAFTA a "rip off" for the U.S., called Monday's announcement a big win. He then delivered his ultimatum to Canada. "One way or the other, we have a deal with Canada," Trump said from the Oval Office, where he was joined on a speaker phone by Mexican President Enrique Pena Nieto. "It will either be a tariff on cars, or it will be a negotiated deal; and frankly a tariff on cars is a much easier way to go, but perhaps the other would be much better for Canada." For Trump, striking a new trade deal with Mexico — and possibly Canada — would be welcomed as a political win for Republicans ahead of the crucial U.S. midterm elections this fall. Mexico would like to seal a new trade agreement before the incoming government of president-elect Andres Manuel Lopez Obrador takes office Dec. 1.